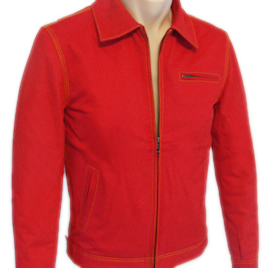 My Red Smallville jacket just arrived in the mail today and I only have one word: PERFECTION! The color of red used on this jacket is amazing and the contrast stitching just makes everything about this jacket awesome! The material used is a lighter canvas, but still obviously durable enough for normal everyday wear. This jacket really looks like it was taken straight from the set of Smallville! Great job! 5 stars!